A fight is heating up between one of the Russia’s largest chemical consortia and members of the local population in Bashkortostan, just south of the Ural mountains. The reason? A disappearing chain of hills known as the Shikhans. For years, the Bashkir Soda Company has been mining these hills for their limestone—the raw material for the soda industry. The threat facing the Shikhans has brought together scientists, campaigners from regional NGOs and concerned members of the local population to oppose the company’s plans. 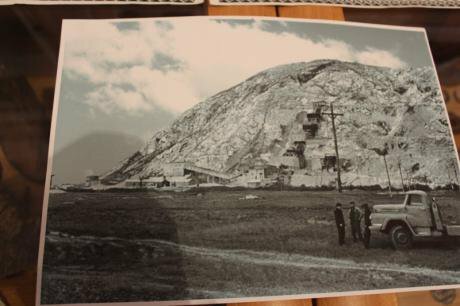 One of these hills, Shakhtau, which sits close to the company’s headquarters in Sterlitamak, has effectively disappeared—its entire mass quarried to feed the kilns. Now the Bashkir Soda Company (BSC) is demanding that a second hill, Toratau, be stripped of its protected status. Otherwise, production at the soda plant will cease several years from now for lack of raw materials. Several thousand people could lose their jobs. The regional government, which has always been equivocal on the issue, has recently announced its intention not to sacrifice the mountain and suggests the soda company find alternative sources for its raw materials. But both sides are busy lobbying Moscow, which, according to the experts, will have the last word on the fate of the hill. 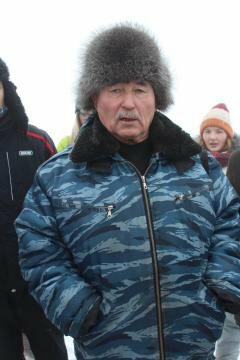 For the Bashkir people, the Shikhans are sacred hills, steeped in tradition. After settling the region in the early middle ages, the Bashkir gave them names: Shakhtau (‘king hill’), Kushtau (‘double hill’), Yuraktau (‘heart hill’) and Toratau (‘fortress hill’). Historians and archaeologists believe there was an ancient Bashkir shrine on the hilltop, and the Shikhans were a ritual site for one of the main Bashkir clans, the Yurmat tribe. In 1965, Toratau and Yuraktau were made ‘complex natural sites of republican significance’ and given protected status. Now this status is under threat. Excavations have also revealed evidence of Bronze and early Iron Age activity, which led to the hills being designated as protected sites in 1960. At roughly the same time, biologists discovered that the Shikhans were an incredibly rich botanic habitat and important for the region’s biodiversity. Specialists believe that examples of a quarter of the republic’s botanical species can be found growing on Toratau and Yuraktau. According to the Russian Academy of Sciences’ Ufa Institute of Biology, Toratau alone is home to 12 species of plant believed to be extinct and 21 species unique to the area. Many of these plants are on Bashkortostan and Russia’s ‘red lists’ of threatened species. In the 1930s, Soviet Bashkortostan was designated as a region ripe for development as a centre for the chemical and cement industries. A geological survey carried out in 1936 revealed that the hills near Sterlitamak were a large source of limestone, the raw material for this sector. It was agreed that development would start with Shakhtau and building began in 1941 on the Sterlitamak soda works, followed by cement and roofing tile plants, for which the Shikhans have become the general supplier of raw materials. 'We will save the Shikhans'. 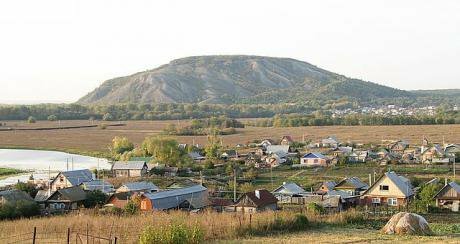 The village of local resident Abdrakhman Validov lies at the foot of Toratau mountain.Folk memory records only instances of unspoken opposition among the local people. ‘In 1955, my granny would say: “You can’t destroy the mountain – there’ll be a serious flood”,’ says Abdrakhman Validov. Regional historic and scientific journals make no reference to any real protest against the project at the time. ‘It was just after the war, and we had to rebuild our country from its ruins. It didn’t occur to anybody,’ says Abdrakhman Validov. By the end of the 20th century, Shakhtau had been almost completely levelled, and the soda company faced a dilemma—to look for sources of limestone elsewhere, to update their technology or to try to have Yuraktau and Toratau stripped of their protected status. The industrialists, who aren’t short of lobbying power, decided that this last option would be the most economical. At the start of the 2000s, the soda company began to push Bashkortostan’s republican government to remove the Shikhans’ protected status. 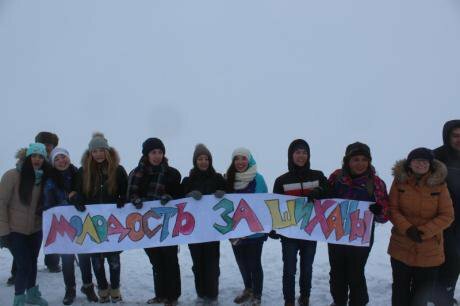 Soon the issue went public, triggering an on-going campaign by Bashkir ethnic organisations, local civic campaigners, environmentalists and other civic activists to save the hills. The core of the resistance campaign took place, however, in government and other official offices. The soda company systematically refused to consider any of the proposed alternative locations for its raw material under the pretext that none of them met their chemical, physical and mechanical specifications. ‘In the early 2000s, we approached Bashnedra, the republic’s subsurface resource management department, asking them to find us another quarrying site,’ the company’s Director of Communications Sergey Lobastov told journalists at his last press conference. ‘They told us to continue quarrying the remains of Shakhtau, saying that there was still enough lime left there. But experts have told us that further development there would be impossible, dangerous even, because of the site’s complex hydro-geological conditions. Then we investigated the Kushtau Shikhan, but the limestone there isn’t of a high enough quality. ‘We went back to Bashnedra, and this time they recommended a site in another district, but once again the limestone was not good enough. And meanwhile a higher office, the Volga regional subsurface management department, ruled that the limestone in the Shikhans was the only suitable raw material for the soda company in the whole republic. In other words, there is no alternative to quarrying Toratau, however undesirable that might be.’ This was Lobastov’s summary of years of public discussion. 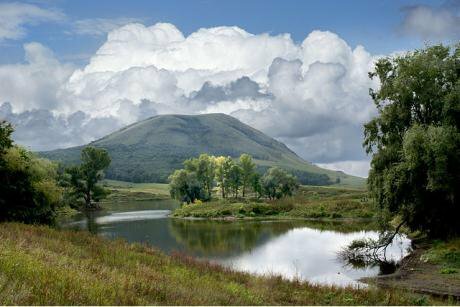 Gone but not forgotten: Shakhtau mountain, Bashkortostan. The industrialists’ arguments, however, have been met with open scepticism by their opponents. ‘I would trust the conclusions of Bashnedra experts, which confirm that there are equally good sources of limestone elsewhere in the republic, but not the statements being made by the company,’ says Aleksandr Veselov, head of the Bashkortostan Ecologists’ Union. In November this year, Khamitov made a series of public statements in which he rejected the soda company’s claim to Toratau. ‘For a long time, our government believed that the only source of the necessary raw material was the Shikhans. We were being, accidently or deliberately, misled. So at some point we needed to establish the real facts of the matter,’ he told a press conference. ‘Preliminary data show that there are other appropriate sites; our republic is fortunate enough to have enormous supplies of limestone, some of which is suitable for the chemical industry and the production of caustic soda.’ Khamitov went on to say that a site that was acceptable to the soda company had finally been located near the village of Gumerovo, only 35km from Shakhtau. Khamitov’s intention to save the Shikhans was supported by the official regional media, members of Bashkortostan’s state assembly and the republic’s Academy of Sciences. The ‘information war’ over the Shikhans has not subsided since the conflict went public. From time to time, supporters of the soda company play the ‘geopolitical’ card, arguing that any holdup with new sites (let alone the closure of the Sterlitamak plant) will play into the hands of manufacturers in Turkey and other countries, who will inevitably penetrate the Russian market. The whole thing turned out to be false, though, as Turkey doesn’t have a ‘Chamber of Commerce’ as such (though there are similar organisations), and search engines identify ‘Mr Sharif Said’ as head of the Chamber of Commerce of Tajikistan. The whole thing turned out to be a scam. ‘All these claims are pure scare tactics, of course’, says Ufa political specialist analyst Stanislav Shkel. ‘The soda company and its supporters will try to frighten people with the threat possible of the closure of the works and the social unrest and so on that would follow.’ Recent instances of online flash mobs showing people trampling packs of soda underfoot are only the latest battles in the information war, though, according to a local NGO protecting the hills, they are potentially sponsored by the factory’s management. In the past few weeks, the defenders of Toratau are worried about the fact that, although the republican authorities are on their side, the federal government has not yet declared its position. Both sides are all too aware that Moscow will call the shots, as it has plenty of leverage on the leadership of the republic. ‘In the end, the decision will be taken by central government, as ‘Soda’ BSC is a concern of strategically significant enterprise,’ comments Ramil Rakhmatov, a correspondent for the local online platform. He also suggests that the company’s position might be supported by Khamitov’s political opponents, as part of their campaign to topple him at the next presidential election. 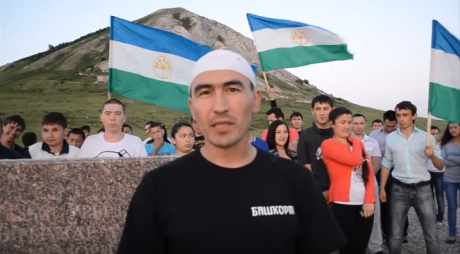 Members of Bashkir ethnic organisations and other local residents have also been adding their voices to the debate, warning of an inevitable confrontation if Toratau is handed over to the soda company. Images two (Abdrakhman Validov), three (Shakhtau), and six (Youth for the Shikhans) courtesy of the author.